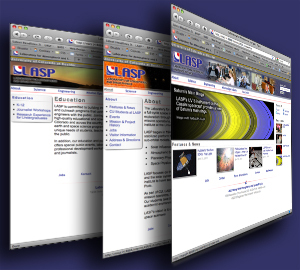 If you are a frequent visitor to the LASP website, you will notice that things have changed. LASP is currently updating its more than 300 web pages across the site, beginning with a new home page and top-level pages. Updates to secondary pages will follow and still currently maintain the older look and feel. Below is a quick guide to get you started on a tour through the new site. If you have any suggestions, please feel free to e-mail us at: info@lasp.colorado.edu. Home Page: In an effort to highlight all of the activities going on at LASP, we’ve introduced a main photo gallery, and “hot buttons” for feature and news stories. Click on any picture to read more information. The “Resources” section on the right side of the home page provides quick access to content a few levels down in the LASP website: information about CU Students at LASP, products for our data users, a list of public events, and the full Features & News archive. The navigation at the bottom of the page provides links to LASP jobs, contact information and a site map. Connect with LASP through social media links maintained by the lab and its programs at the top right corner of the page. Please contact us with questions or comments, and let us know if you encounter broken links or out-of-place information as we work through the process of redesigning the website. We appreciate your patience as we move toward a site that will offer an improved user experience.